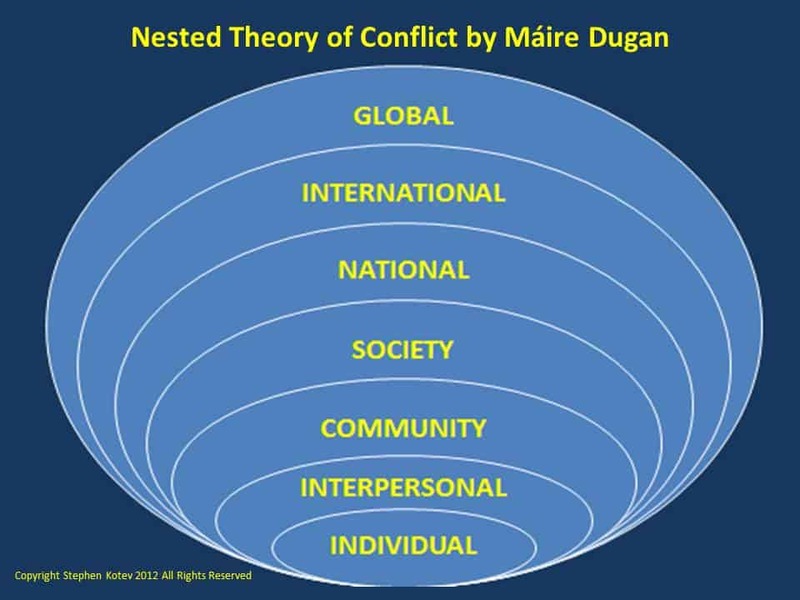 While I was earning my Masters in Conflict Analysis and Resolution from George Mason’s School for Conflict Analysis and Resolution I was introduced to this theory. 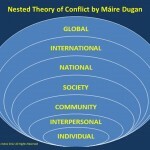 It a simple concept called the Nested Theory of Conflict by Máire Dugan. Imagine a spider web or a ripple in a pond; it has a small ripple or circle surrounded by progressively larger and larger circles. In the center of the web or the ripple is the individual (aka you). The next larger circle is the interpersonal level (you and someone else), and next is your community, then your society, your nation, international and finally global. Another example is matryoshkas, the iconic Russian dolls that start small and get progressively bigger and bigger. You start small and work your way up to larger and larger groups. How this concept works is that you use it like you would a pair of glasses. You look at the problem through these new lenses to see what is going wrong. Some time it’s just you. Other times it’s just your coworker. It could be your team or your community that is the problem. Or it could be a national problem like the recession that is giving you the blues. Often it is a combination of several factors that is either the cause of your problem or is part of the solution. It’s easy to jumble all of your problems together; when you do this it makes the problem look unsolvable. By using this simple concept you can sort out the problems into manageable layers or segments. Using this concept will help you properly ‘calibrate’ your actions. Sometimes you are angry at the wrong person, or the person you have a problem with is really just a symptom of a larger problem. This concept will help you ‘organize’ and better understand the conflict so you can work it out and get on with your life. This is very interesting and I want to be part of it. Thank you for your inquiry. My goal is to help others understand these concepts so they can be better prepared to deal with conflict. To answer your question, no I did not modify the original model. I just presented it in a more concise manner. Yes, this concept is very valuable and can transform how you understand crisis and conflict. Thank you for your kind words and all the best.